New Corsa: more mpg, more kit | What Car? 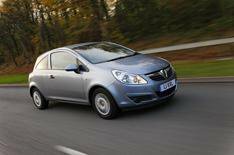 Improved efficiency means the Vauxhall Corsa should be the top-selling range of sub-125g/km cars in 2010. What's more, from April, all manual Corsas will be free from VED*. All models, except the sporty VXR, will exceed an average of 50mpg when fitted with a manual gearbox. Top of the economy chart is the 94bhp diesel Ecoflex model, which promises 76.3mpg. The 1.0-litre petrol engine has been given an extra 4bhp to produce 64bhp, while emitting just 117g/km of CO2 dropping it two bands for VED and ensuring that from April 2010 owners won't have to pay VED. Both the 1.2-litre and the1.4-litre petrol engines have been given more power, up to 84bhp and 99bhp, while emissions have been reduced. Joining the Ecoflex diesel model is a 74bhp version of the same 1.3-litre engine that emits 114g/km of CO2, and a more powerful 1.7-litre with 129bhp, which has dropped 12g/km of CO2. A new eco gearshift indicator in the dashboard is available on most models to help drivers ensure they're using the most economical gear for prevailing driving conditions. Revisions to the Corsa's suspension set-up will improve both the ride and handling. These include softer springs in the front suspension, revised shock absorber settings and an optional retuned stability control system. The Corsa's steering has also been tweaked. Key models in the range will get additional equipment fitted as standard. SE, SXi and SRi cars will get cruise control and a trip computer. The starting price for SRi models has been lowered, and these cars now have revised suspension, air-conditioning, 17-inch alloy wheels and a VXR styling kit included in the price. SXi and SRi remain unchanged. All new cars with CO2 emissions of 130g/km or less don't have to pay road tax for the first year.